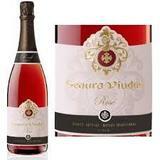 Our Rosé delivers an intense fruitiness both on the nose and palate, with lively color and finesse. The native Trepat grape, a rare varietal that is still sparsely planted, dominates the blend and provides fresh fruit aromas and finesse. A refreshing and balanced cava thanks to its meticulous blending and finishing, the touch of Garnacha creates a smooth finish.